Keyes Point is a private remote fly-in community located in Alaska on Lake Clark, within Lake Clark National Park. 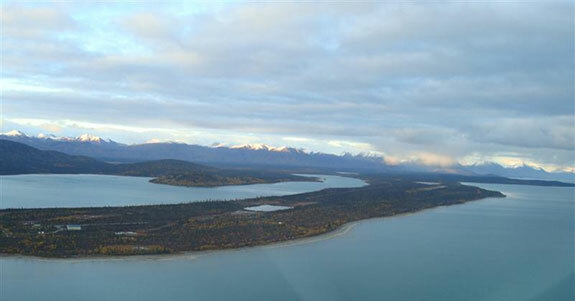 Keyes Point encompasses over 1000 acres of waterfront property on Lake Clark. Keyes Point is regulated by covenants, conditions and restrictions governed by the Keyes Point Property Owners Association. Association owned common properties including the roads, the 3700 foot runway, caretaker cabin, very small rental cabins and the fuel storage and dispensing systems. The runway, roads and fuel are for use by property owners only and are not open for public use. The Association maintains equipment including a road grader, a backhoe, a dozer, a dump truck and a roadside mower. Property owners can easily acquire diesel fuel, auto fuel, AVGAS and exchange 100lb propane tanks with the Association caretaker. The caretaker maintains the conditions of the roads and runway, maintains and dispenses fuel, facilitates propane exchange and keeps a watchful eye over all property owners residences. There is a caretaker present at Keyes Point every week of the year. Keyes Point is easily accessible via wheel plane or floatplane. The well developed and maintained gravel runway accommodates up to C130 freight aircraft. Common aircraft using the runway include, Cessnas, Supercubs, Navajos, DC3s, Caravans and even a few Pilatus PC12. The Keyes Point Property Owners Association employs Roy Briley Property Managers from Anchorage AK as its property business managers. Brileys office handles payables and financials for the Association. Most home owners at Keyes Point have affordable internet and phone service via satellite dish. Property owner cost of ownership is very low at Keyes Point. Association dues are less than $400 per year per lot. There are no property taxes at Keyes Point.